We came across yet another new senior community the other day. They seem to be popping up like mushrooms everywhere around here lately. If you’re looking for a sound investment, I would suggest investing in senior living communities. Baby boomers are beginning to come into retirement (news flash…duh! 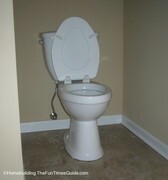 ), living longer and many want to down-size their living quarters for many sound reasons. Greenbrooke Senior Community in Hiram, GA has a lot going for it. It is within walking distance of just about all of the shopping and dining that Hiram has to offer (e.g. Super Target, Sam’s Club, Wal-Mart, K-Mart, Kroger, Kohl’s, Movies 278, Home Depot, Pet Smart and many, many franchise eateries…with the exception of Jim & Nick’s Bar B Q). You get the idea. Not that I would suggest that some of the senior folks that are going to be occupying Greenbrooke Senior Community take their chances crossing a (very busy) 4 lane highway (S.R. 278). Everything is in close proximity to this new senior housing community. ’nuff said. These units are basically all alike from the ones that we looked at. Every housing unit (building) is exactly the same size and shape. Every building houses 4 units. Each unit is 2 bdr/1.5 bth, living room, kitchen, 1-car carport w/storage closet, laundry room and that’s it. Basic, no-frills housing currently leasing for $895/month. These are apartments, not homes or condos. They are expensive for such tiny units. Sandy pointed out that the door handles are ALL round and not ADA compliant. Not that they have to be because these are residences but this is being marketed as a senior living community, therefore, they should make more of an effort to accommodate their target customer. Some residents may have conditions that limit their flexibility such as arthritis. It seemed like such a slam dunk to put handles rather than knobs on all of the doors. C’mon (designer) people, THINK! 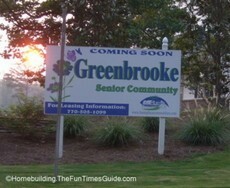 Greenbrooke is a development of Senior Communities Management, Inc d.b.a. 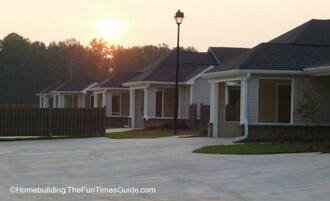 Homeplace Communities.